Mink and his cycling team embark on their journey. He admits teaching an online class while on the road presents its difficulties, but he’s figured out a few work-arounds. Mink plans to leave early each morning to ensure he’s available for class at night, and will hold regular office hours, just as he would on campus. He is even carrying a thumb drive programmed with a wireless hot-spot in case his internet is unstable. Mink began the 84-day trip on August 1, 2016, joined by two fellow cycling-enthusiasts and his wife in a sports vehicle. 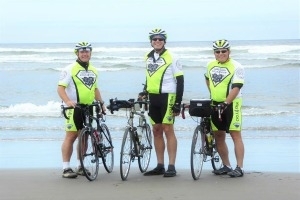 The team will travel from Oregon to Virginia on the Bicentennial Trail, a historic biking route that winds along the Oregon Trail, through Yellowstone National Park, and past Colorado Springs, eventually ending in the colonial city of Yorktown, Virginia. While Mink is excited for the trip itself, it holds a deeper purpose than just recreation. Mink and his colleagues are cycling cross-country to raise money for the Children’s Science Center, a DC-area non-profit dedicated to STEM (science-technology-engineering-math) education. They aim to raise over $5,000 to help fund the organization’s education and outreach programs. Teaching on-the-go means ease of communication is essential. Mink’s online classroom was designed with this in mind, making it simple to connect with students while he’s on the road. Dubbed “2KSB” by its creator 2U, Kogod’s technology partner, the virtual classroom is “well-designed” and provides “lots of great opportunities for interaction,” according to Mink. He also advocates for online classes on the basis of developing essential technology skills. Although students are well-versed in social media platforms such as Facebook or Instagram, Mink has noticed they have little experience with business technology. Online classes expose students to tools companies use for communication and organization, helping them develop valuable skills to use outside of academia. Mink is grateful for the opportunity to teach at Kogod, a position he could not have accepted if required to teach on-campus. His experience highlights another benefit of online education—securing faculty who would otherwise be unavailable. Virtual learning provides access to a greater pool of faculty, many of whom have rich and varied perspectives to offer students. As Mink continues on his Trans-American journey, he is excited to explore new places and meet different people as he manages his class. The trip is projected to end mid-October, after which he will immerse himself in family, work and other priorities he sacrificed while on the trail. He’s looking forward to the day his online teaching experiences will come full-circle. As a global traveler, it’s only a matter of time before his life path intersects with one of his online students. “One day, I know I’ll end up in the same city as one of my students and we can host a class together in the same video frame,” Mink says.